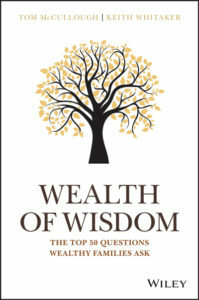 Wealth of Wisdom: The Top 50 Questions Wealthy Families Ask, the new book by Northwood Chairman Tom McCullough and family advisor Keith Whitaker, is now available for purchase on Amazon and other major booksellers. The global book tour kicked off earlier this month at the University of Toronto, where over 200 people came out to hear Tom speak about the book and receive signed copies. The tour continues throughout the spring to 10 cities across three continents, including Singapore, London, New York, Miami and Vancouver. You can also check out the book’s website at wealthofwisdombook.com, which features a series of podcast interviews with the contributing authors. Scott Dickenson is a member of Northwood's client development and client service teams. In his client development role, he is responsible for strategy, communication, education and new client growth. In his client service role, he works with Northwood’s client families in the areas of financial planning, investment management and taxation. 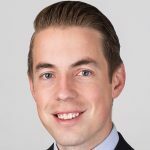 Scott is a Chartered Financial Analyst (CFA) charterholder and a member of the Toronto CFA Society. He holds a Masters of Business Administration (MBA) from the Rotman School of Management at the University of Toronto, and an Honours Bachelor of Commerce (BCom) from the Smith School of Business at Queen’s University.